Q: How did you learn about Southwest Florida? 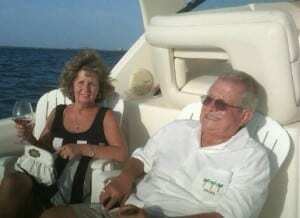 A: Barb and I found Southwest Florida through an online search of “places to retire in Florida.” We knew we wanted to live on or near a coastline, so we started comparing prices along the Gulf coast from Tampa to Naples. Q: How did you find Dave and Brenda? A: During our Internet search, we came across Dave and Brenda’s website. We realized they had a nice mix of property values, so we contacted them for more information. Dave replied promptly, and he sent us a handful of listings that met our criterion. Q: When did you start looking (research phase) and when did you purchase? A: The process took us a total of four months. Q: If you remember, how many properties did you view in person before deciding on the one you purchased? A: We viewed about 30 properties in Cape Coral, Fort Myers and Punta Gorda. Q: What style of property did you purchase and where is it located? A: We purchased a single family home on the Caloosahatchee River in the Cape Coral Yacht Club neighborhood. Q: Why did you choose SWFL and what do you love most about the area? A: In Southwest Florida, everybody’s from somewhere. People move here from all over: Canada, New England, Michigan, etc. It’s an eclectic mix of different people with various backgrounds. Q: Were you looking in other areas of FL? A: We limited our search to the Gulf Coast between Tampa and Naples, but we quickly narrowed it down to Cape Coral, Fort Myers and Punta Gorda. We realized you can get a whole lot more for your money in Cape Coral than in Naples. And Cape Coral’s low crime rate really stood out. Q: What role did Dave and/or Brenda play in helping you find the perfect property? A: Brenda is technical and detail-oriented while Dave talks about the picture. Their skills complement each other nicely. Both Dave and Brenda joined in our property search. They even took us on their boat to get a different perspective of the properties. Q: How did your closing go and what services did they provide to assist? A: It went without a hitch. Brenda did a great job of selecting the closing company. We just had to sign documents, drop off a check and away we went. There was no difficulty at all. It was really terrific. Q: Did Dave and Brenda help you settle in after closing and if so, in what ways? A: Absolutely. They gave us a whole information packet that covered where to get licenses for our dogs, how housing taxes work, neighborhood demographics and history, utility hookups, where to shop for food, etc. It was a huge help since we weren’t familiar with the area. Q: What stood out the most for you in working with Dave and Brenda? A: They really genuinely listened to what we wanted. All of the listings they presented were in the range of what we wanted to see. That personal skill of understanding what we wanted is what we appreciated most. That and their friendship. They took good care of us, and I highly recommend them. They do an excellent job. Do you have questions about moving to Southwest Florida? For a smooth move to SWFL, contact Dave and Brenda of SageRealtor Group. They’ll answer any and all of your real estate questions and stick by your side throughout the entire process. For more information about Southwest Florida real estate, contact Dave and Brenda by clicking here or calling 239-896-8549. Browse client letters: their experiences shopping, why they chose the area, and more.